In an attempt to have a vehicle related thread, as opposed to body parts and with a nod to all the fuss about MoT exception, what was the state of your first vehicle? My first proper car was a 1964 Hillman Imp, it was fitted with oak sills, ( had a joiner relative), covered with fiberglass and doors held closed by toilet door bolts, do they didn't fly open on corners .. passed an MoT for several years! theBusmonkey, art b, Soggz and 9 others like this. My first car was a '66 Hillman Imp, didn't have the optional extras like yours though! Mine looked ok but eventually I had to replace an outer cill, that's when I found the inner panel of the cill was solid rust ! 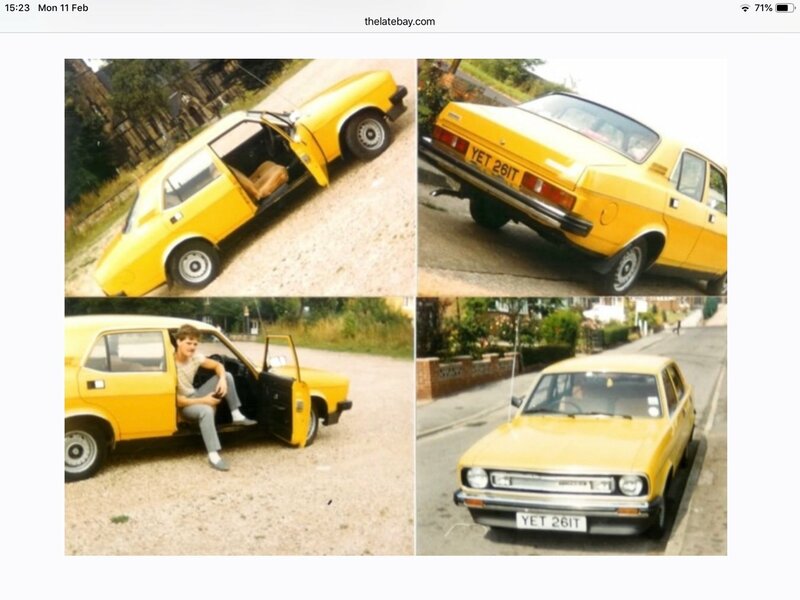 My first car was a Morris 1100 ,on the way to Great Yarmouth for a camping trip with two mates ,that radio caught fire and the whole of the floor in the boot dropped on to the road along with a borrowed 12 man scout tent and a supply of beer. art b, Poptop2, Gingerbus and 1 other person like this. art b, Bhubesi, Barneyrubble and 6 others like this. But do you secretly wish you’d still got it in the garage? Barneyrubble and jivedubbin like this. Barneyrubble, Poptop2 and jivedubbin like this. First car for me was a Morris Ital (I was talked into it instead of a beetle by my idiot brother in law). Bought it from a Vauxhall dealer in Rotherham and they put a full years MOT on it. Took it back 3 weeks later as it was making an awful sound and the head mechanic (not knowing I’d purchased it from there 3 weeks earlier) stated the bottom trunion had gone and the car was unsafe to drive! They fixed it stating the fault wasn’t covered by the warranty (what ever is) and I was told I’d have to pay a third as would they and the warranty company.....£80 bill back in 1983 wasn’t cheap and a year later when the trunion on the opposite side went and I fixed it myself I discovered the part cost £14! art b, Bhubesi, Gingerbus and 2 others like this. Mini 850 in à lovely shade of brown... was actually a decent example until I wrote it off... then got another one that used to go down the road like a crab, due to the rear subframe hanging off..
My first car was a 1952 split screen Morris Minor convertible 'the pram' but it did have 16 valves!!!!! eight in the side valve engine and eight in the radio!!! The radio took as long as the engine to warm up. The radio started smoking while cruising along Southend Sea front so tore it out and over the sea wall in went. Gingerbus, jivedubbin and Betty the Bay like this. I had the saloon version and such was my enthusiasm that I bought it 6 months before I passed my driving test. I kept it in the car park at Oxford Tech College and use to drive it round at night. Almost as soon as I passed my test, I went and shunted a car in Leicester on my way to the Lake District. It bashed both back and front of the car in front as it got knocked into car in front of him. My car suffered no damage at all as the bumpers were really solid. The brakes were terrible mind. jivedubbin and Betty the Bay like this. Found it painful to "like" a post about a Marina .... even if it had gone a bit Italiano. IZZYBAY, Bhubesi, Poptop2 and 2 others like this. I used a 6 inch nail to drain the boot on my £100 Marina. Bhubesi, Gingerbus and jivedubbin like this. I bought a splitty so42 camper when i was 17 as I had dreams of doing it up and using it, but it was beyond my abilities and I scrapped it. I only sold the interior a few years back. But having any car got me a girlfriend .. still married 33 years on. Carpet wrapped round steering column snaps on lane changes on motorway, tyres yelp. No starter ring (sometimes) .. cut most of the way through oil pump body as the ring rattled around the flywheel after starting until it bounced off the oil pump and then stayed on each journey. Had to single handed bump start was fit enough from cycling to do that on the flat. Once did 100mph and jammed carb float down petrol poured out. Dent in inner wing from carb as engine mounts were gone and clutch was oily. Once drove 150 miles with no cooling water on a freezing day. art b and Gingerbus like this. And the faults with the girlfriend? Faust, paradox and Gingerbus like this. IZZYBAY, jivedubbin and Gingerbus like this.